Modern Warfare 3's Spec Ops mode will let you get most of the perks of multiplayer, without having to listen to squawking pre-teens on the internet. Sledgehammer Games' co-founder Michael Condrey says that the Spec Ops mode in Call of Duty: Modern Warfare 3 is a great way for players to get ready for the game's multiplayer, without having to worry about being shot in the face from the other side of the map by a guy in DÃ¼sseldorf. Condrey said that Spec Ops was a lot of fun in its own right, but that the survival mode - which is the Modern Warfare equivalent of Treyarch's zombie mode - was a great training ground for multiplayer, as it took place on the same maps. 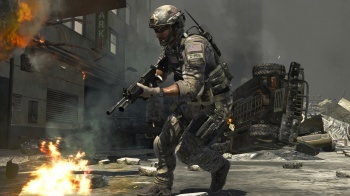 In addition, Spec Ops would allow players to rank and try out new perks and weapons as they level up, completely separate from the game's multiplayer. This will undoubtedly come as good news for Call of Duty multiplayer neophytes, or casual players who want to play against other people, but are discouraged by not knowing where they're going and not having a chance to find out because they're constantly being stabbed, shot, or blown up. I wouldn't be surprised though, if Spec Ops replaces traditional multiplayer for some people. It's got most of the benefits, like playing with friends and unlocking new weapons, without the downsides of having to put up with griefing, cheating, and the internet's other undesirable residents. Call of Duty: Modern Warfare 3 comes out for PC, PS3, Xbox 360, and Wii on November 8th.